An ideal place to stay to experience the wonderful city of Lincoln! In the middle of the cultural area, you will find the Lincoln Museum, Usher Gallery, Theatre Royal and Drill Hall, all within a minute's walking distance. Within 30 seconds, you can wander up the cobbled “Steep Hill” and discover wonderful boutiques, tea rooms, craft and gifts shops, restaurants and pubs, leading to the impressive cathedral and castle attractions. You can't help but feel like you are in a Dickens tale! This vibrant city integrates an amazingly rich history with modern culture and a vast array of attractions, stretching from the Bailgate area all the way down to the Brayford pool and beyond. Walking down the hill all the way to the High Street is a shopper's paradise, located in an equally beautiful setting. 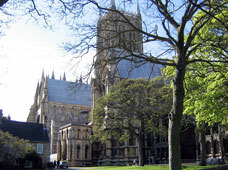 For visits of longer than three days, the best way to see the main attractions is to purchase the City time travel pass, giving you unlimited access to Lincoln Cathedral, Lincoln Castle, the Medieval Bishops' Palace, so you can take your time to soak up the history.